Homies are a series of 2-inch figurines loosely based upon Chicano (Mexican American) characters in the life of artist David Gonzales. First created in 1998, these plastic figurines were initially sold via vending machines typically positioned in supermarkets, mainly in International marts. Homies have become a highly collectible item among fans of the line. Many imitation toys have hit the market following the success of Homies. The figures caused controversy after their initial release as members of the Los Angeles Police Department (LAPD), argued that the figures glorified gang life. Many stores stopped selling the toys after the LAPD complained. Gonzales then created a story for each of the Homies’ characters, each of which had a positive view of the characters. Some of them became former jailmates who went on to educate children about how to avoid jail. Mainstream stores, such as Walmart, quickly returned the Homies to their stocks, and the toy branched out to include a line of die cast cars, among other things. By 2005, the Homies character line had women, as well as Filipino, Japanese and Puerto Rican, and even Evil Clown characters. The Puerto Ricans set, which includes twelve of the Homies, are nicknamed Los Boricuas. According to Gonzales, he has received orders from countries in Europe, South America and Africa requesting characters representing people from those continents. 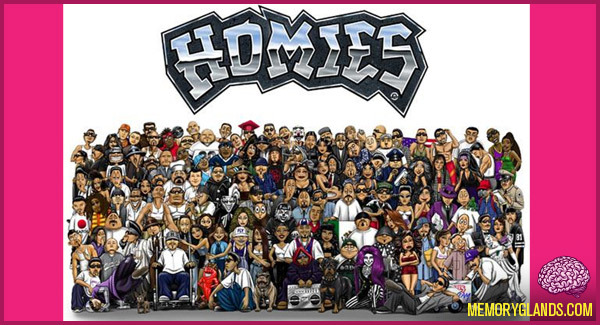 In 2004, the creators of Homies, created ‘Los Mijos’ intended for a younger audience. They are solely Hispanic and are portrayed as kids, babies, and teens. In 2007, a show was made about the figures called The Homies Hip Hop Show. The show had many negative reviews saying the figures don’t even move, all they do is stand there and shake. The show did make it to DVD.